Peugeot has finally unveiled the cover from speculated follow up to Onyx Concept; Peugeot Exalt Concept 2014. With some commendable exterior looks this all new concept has state-of-the-art interior, which will feature the future of automotive industry. We really wish that let that be a limited edition but Peugeot must come up with the production version of Exalt Concept 2014. Let us have a closer look and get to know more about this new release. Interior of Peugeot Exalt Concept 2014 in the words of company is described as ‘i-cockpit’. Center stack and dashboard get the black ebony wood work while the wood trimmed and leather wrapped steering wheel is another distinct work. Instrument cluster behind the steering wheel features dual-folding touchscreen displays, which we believe is a commendable addition to the interior. Upon dashboard another thing to come into your notice are the nine toggle switches serving separate purposes assigned to them. Natural wool based fabric ‘chine’ covers the bucket seats giving a comfortable seat while the neighbor parts get some old-leather work getting accompanied by basalt fiber. 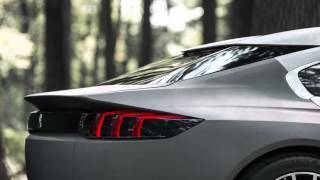 In all the interior of Peugeot Exalt Concept 2014 is futuristic and attractive for us and we believe for ‘futuristic’ to be mentioned here is about something that goes beyond our heads. Exterior of Peugeot Exalt Concept 2014 is more of a homage company is paying to the French cars created in 20s and 30s. Exposed steel body looks like one beaten to bring into shape getting finishing through ‘crude steel’. Taking a look at front fascia of Exalt Concept 2014 dual headlamps set in bumper makes a good house over its long hood. In between these another distinct creation could be noticed which we call grille, however rest of the body gets work of ‘shark skin’ as conveyed by Peugeot. 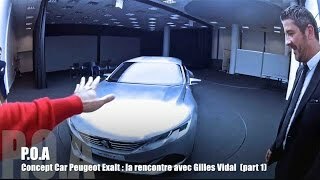 This really unique work according to company not only contributes to looks but also serve the purpose through improving aerodynamic performance of Peugeot Exalt Concept. Peugeot Exalt Concept 2014 gets its power through a 1.6 Liter turbocharged four-cylinder gas engine producing 270 hp and 330 nm torque. However the Exalt Concept 2014 gets hike in its power through a linked electric motor that produces extra 70 HP and thus the total output of Peugeot Exalt Concept 2014 reaches 340 HP pairing to six- speed automatic transmission.